The purpose of a contact center, your contact center, is to support the customer driven enterprise. It is the hub of customer communications, interactions and engagement, now and will be, well into the future. From Customer Centricity to Customer Experience and Customer Journeys, the simple premise is to always consider the customer the center of everything you do as a business—where better to serve these needs than from the contact center? As technology evolves, so too does the way your customers use technology to both communicate and to get her job done. The question you should be asking yourself, ‘How do I keep pace, making sure I have the right Vision, Goals and Strategy to execute’? In a short post, I can only scratch the surface of the six core tenets of a solid customer communications strategy. In this context, the contact center and customer service seem interchangeable, but this is not quite true. The modern contact center can and should be so much more than faceless, emotionless communications. In the perfect world, a product should do “what it says on the tin” and “the best customer service is no customer service”. The reality is that communicating with your customers is critically important, and this will always be the case. In the contact center, the people have historically been those with service representative or agent somewhere in their title, yes that simple. Now and in the future, this is no longer going to be acceptable. Organizations need to change this, if they want to grow and prosper; is it enough to simply survive, or is thrive the operative word? The ‘front face’ and ‘voice’ of all organizations is expanding beyond customers service to different parts of the enterprise; marketing, product, sales and the executives. Products and services are becoming more complex. Engagement, collaboration and knowledge sharing are not just ideas, they are action words. The number of people who need to understand your corporate vision is bigger than ever. The people in the organization need to be empowered to act, flexible in approach and dynamic in delivery, even more so than the technological components. A process is a series of actions. Coordination is that series of actions within and across the enterprise, either with people or systems. Sometimes, a process is simple and does not require a lot of coordination, sometimes it is quite complex. A process can be how a person needs to accomplish a task, or how a machine needs to accomplish a task. The key is not how well defined a process is, rather how easily it can be changed to meet the needs of the customer. Technology can mean many things, different to each persona and perspective. For this discussion, the channels of communications supported by your organization are the focus. Channels supported need to adapt to the changing usage by your customers. It is likely that your customers enjoy changing modes of communication, possibly even mid-stream, during a process. This is their prerogative. Real-time, synchronous channels are more expensive, but studies show that satisfaction rates are also higher on these channels. Customers do want to use new channels such as social media and web-chat to interact with a businesses—but they want these in addition to (not instead of) established, ‘traditional’ ones (Phone or Email). That’s because their channel choice will depend on why, where and when they are contacting the business. Often customers will use (or would like to use) multiple channels during a single ‘transaction’—for example, researching a new product or service online and reading peer reviews (community) before purchasing in store then using help forums to discover new features. And if there’s a problem, they may want to talk to someone. Technology certainly includes more than just channels of communications. Your ability to integrate data and information from the old and stodgy to the new and cool are critical to the success of the modern contact center. 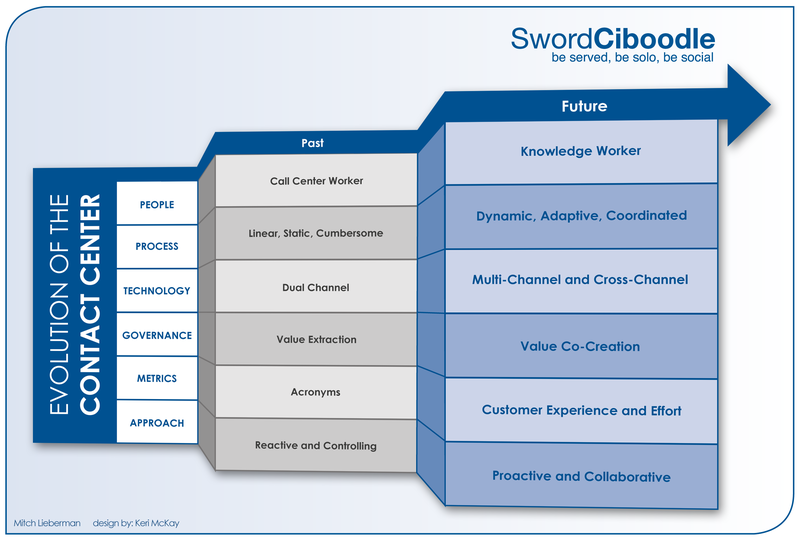 Co-creation emphasizes the generation and ongoing realization of mutual organization-customer value. Historically, organizations would spend time and effort to extract as much value out of a relationship as possible. Customers are now more knowledgeable, connected and interactive with each other than they have ever been. The governance model of the customer driven enterprise will increasingly be focused on co-creation. Your contact center needs to be part of the game. Co-created value arises in the form of personalized or unique experiences for the customer (value-in-use). Value is co-created with customers if and when a customer is able to personalize his/her experience using a firm’s product-service proposition. An example of value extraction is the parking lot attendant who charges you an extra day for a 1⁄2 hour overage, or the rental car company who charges ridiculous rates for gasoline. Businesses need to get smarter here. Metrics are similar to the governance, but there are subtle differences. Where governance focuses on value co-creation, metrics are how things are measured. Too often, metrics are used to validate Return On Investment (ROI), where the importance of metrics for the modern company is further ‘down-stream’ in areas such as customer loyalty, customer satisfaction and retention. In the contact center the traditional metrics are Average Handle Time (AHT) and first call resolution. The legacy operational cost savings metrics might actually get in the way of positive customer experience, driving down satisfaction and loyalty ratings. More and more of the forward-looking organizations are using handle time as a training tool, not to measure the business. A very interesting measurement is customer effort, which asks a very simple question “How much effort did you personally have to put forth to handle your request?” and has shown to be predictive of repurchase, for example. Collaboration is working together to achieve a goal. It is a recursive process where two or more people or organizations work together to realize shared goals, (this is more than the intersection of common goals seen in co-operative ventures, but a deep, collective, determination to reach an identical objective)—for example, an intriguing endeavour that is creative in nature—by sharing knowledge, learning and building consensus. (Wikipedia). We believe collaboration and co-operation are closely aligned, with emotional elements highlighting the differences. The more someone is controlled, the less positive the experience ‘feels’. Being proactive is simply getting ahead of potential issues, not waiting for them to happen to you. Is it possible to put it all together? Yes it is. It is going to take work? Yes it will. I do not believe you can accomplish it all at once, nor should you try. That said, understanding how all the of the elements are interrelated is an imperative. Some of the elements are within the control of the IT department; some are in Sales and Marketing, while you can control some as well. A technology solution will provide a solid base upon which you can meet the goals and objectives set forth by your mission as an organization. The strategy to accomplish each goal is about the people and the process; supported by technology. Customer expectations are evolving and customers are more vocal and willing to share both when something is good and something is bad. 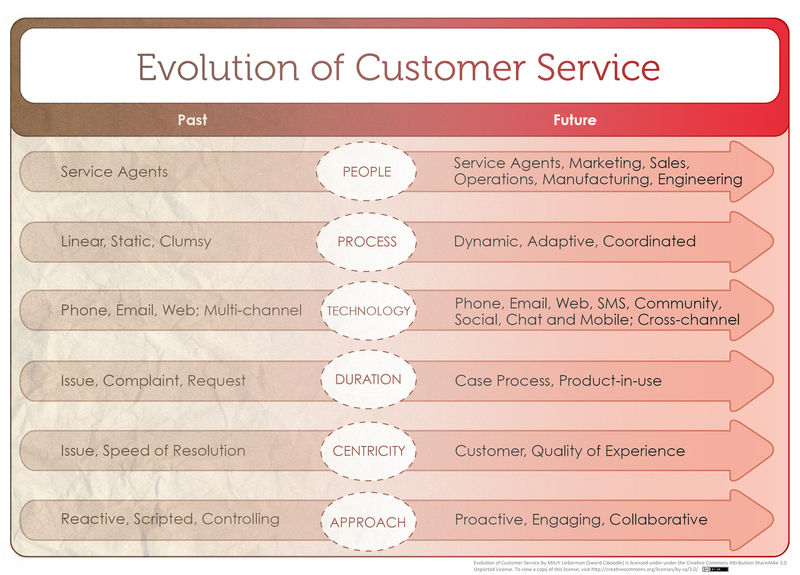 Customer service is also evolving, frankly, in order to keep pace with customers; but is the pace fast enough? The pace of the change; driven by customers, is accelerating because the social web (commerce and network) has enabled and empowered customers. Try and think back 10-15 years ago; did you make purchases online? Other than ask friends, did you read online reviews? What levels of service were tolerable, did you accept? When you needed to contact a company did you consider sending a text? You might have sent an email, but when something really needed to happen, you picked up the phone. You might have even sent a letter, you know, the kind requiring a stamp. The people involved in customer service, historically, had been the people with customer service somewhere in their title, yes that simple. Organizations need to change this, if they want to grow and prosper (survive?). Products and services are becoming more complex, other parts of the organization absolutely need to become part of the customer engagement process. I am not simply talking about transferring phone calls; it is much bigger than that. I am talking about collaboration and knowledge sharing. You might even call it social business, but I do not want to get ahead of myself. Gone are the days of a paper manual with defined processes for as many scenarios as management can think up. Actually, for some those days are not actually gone. Customers are no longer interested in listening to the script, following the guided path nor being pushed towards the efficient route . If the ‘people’ part of the evolution is accurate, then organizations will also need a way to coordinate activities with other parts of the organization. Yelling over the cubicle does not count as collaboration and sticky notes do not count as knowledge management. A technical discussion could be approached from many different directions. With respect to this conversation, the more interesting technical element has to do with the channel match which needs to occur between the desire of the organization and the needs of the customer; i.e. the channels of communication used by each. Not only do organizations need to adapt to the changing channel usage by their customers, they need to realize that customer ‘channel hop’ – changing their mode of communication even mid-stream within an interaction happens. Organizations need to consider active pull, versus push to optimize their channel strategy. Active pull means that the value offered on channels you would like people to use is valuable to them, not just you. Real-time, synchronous channels are more expensive, but studies show that satisfaction rates are also higher on these channels. Historically, the length of time spent by either side of an interaction was limited to the specific activity performed, or issue discussed. Customer Service metrics are often tied to duration, like average handle time. While not every interaction will take on a life of its own, interactions will create a string of communications and form the basis of an ongoing relationship between customer and organization. Enhanced, more sophisticated activities like co-creation and ideation will now take place as well, during product use when it can be most beneficial. This is not about creating life-long friendships, your customer does not want to be your BFF either, this is about working together to mutual benefit. Take the time required to solve the problem, and make sure the customer’s concerns are heard. As noted above, metrics and KPIs have been driving Contact Centers since the beginning of time <hyperbole>. The truth is handle time and concepts such as first call resolution will continue to be used, but they will not be the only driving force. As a matter of fact, these metrics will move further down, possibly even to tertiary consideration. As opposed to simply figuring out how quickly they are able to get the customer off of the phone, customer service professionals will consider more than just the current case and will be given latitude to do the right thing and stay on the phone to help the customer. Insights towards customer need by the agent will be augmented by business intelligence both real-time and in aggregate. Few people appreciate being caught off-guard, unprepared or surprised. Customer issues are more often than not identified first by the customer. What if the customer service teams could identify potential issues and do something about them before the small issues become very large issues? This can be accomplished simply with operational metrics made available to agents (insights). Spending a few more minutes on the phone with a customer, to really understand the root cause of an issue is worth the time and effort. Or, how about proactive notifications of outages, or product issues (positive call deflections)? Further, taking the time to collaborate with the internal organization, providing superior value to customers, will also reap rewards in the form of loyalty and future business. Yes it is. It is going to take work? Yes it will. I do not believe you can accomplish it all at once, nor should you try. That said, understanding how all the of the elements are interrelated is an imperative. Some of the elements are within the control of the IT department; some are in Sales and Marketing, while you can control some as well. In the end, it not really about control; Customer Service is about doing what is best for the customer. What do you think? Am I way off base? Remember, that the Social Engine is my own metaphor for what drives Social Business. My objective is not to cram the word “Social” into the first paragraph as many times as possible, it just looks that way. Social is top of mind, and many people are simply trying to put it all together. So, how about this – I have my networks, my media, I talk about CRM, and I do business with people (left that overused word out). Whether you are talking about Collaboration, Relationships, Knowledge Flows, Engagement, Expectations…It all comes down to people. At the core, Social simply means sharing with other people, in the digital sense, it is done in the open. I wish I could take credit for that statement. Proper attribution goes to Michael Fauscette from IDC. We both attended the #scrmsummit last week in Washington, DC. The statement is not some esoteric, bigger than life hyperbole. It is quite simple really. You cannot have any of these things without people. A Social Business employs people, just as a Social Customer is reliant upon people. A Social Business is one that recognizes the amplification effect – the amplification of value by continuously meeting (or exceeding) the dynamic expectations of the social customer. If you do a good job, other people will hear it. As we are all well aware the converse is certainly true as well. Co-creation is another one of those terms which seems overly complex, people throw it around, seem to be scared by it. Paul Greenberg reminded everyone that is does NOT have to be complicated. Friend Wim Rampen writes about it often. I will be honest, it is a term that has scared me. I will give a simplistic example, surely to be corrected (but write and learn right?). Say you are at the local Pizza joint and you select a few cool toppings from the ‘make your own’ section. You also suggest a new topping, say Pineapple. The restaurant does not have Pinneapple, but makes note of it. As it turns out, when talking to other patrons, Pinneapple is an ingredient that is more popular than they thought. Within a week, the restaurant not only adds the ingredient to the menu, but offer a special rate of a pre-made pizza that has Pinneapple as a topping. Wim Rampen wrote a great post on this topic a few weeks ago, along with some great dialog and conversation after the post. My favorite theme is that Customers (People) do not value a relationship with a company, rather the outcomes that can be generated by such a relationship. The one addition I make here is that it may be not only customers, but potential customers, influencers, partners and communities (groups of people). Strong, value driven relationships are crucial components for the fuel that drives a Social Business. “Social CRM recognizes that current technologies enable customers spontaneously to form large, ad hoc interest groups at remarkable, sometimes even viral, speed”. Esteban Kolsky commented here that these “impromptu communities” are going to help “advance social CRM faster by not worrying about the channels (Facebook, Twitter, Forums) and focus on the behaviors and data.” I will extend Esteban’s comments and say this is beyond Social CRM, but will help fuel the value derived by all members of the ecosystem for any particular Social Business. There are many factors which drive experience. I am not going to call it customer experience, as the Social Business it needs to go beyond the customer. Customer Experience Management is nearly an entire discipline, one that I try to be well read, but tepid to weigh in strongly on. I will speak more from a logical viewpoint, people enjoy (or not) an experience on a relative scale. The scale is based upon their expectations. Esteban recently wrote a post, where we did not comment enough, so we did not meet his expectations. I am not a customer of Esteban, but we work in the same ecosystem. I am using this to simply illustrate the point that experience within a Social Business happens many many ways, beyond just product and service. By the way, he wrote a second post, just about expectations (I took the bait there). ‘Meeting’ or ‘Exceeding’ is an interesting conversation, for my purposes here, there is a bar, you need to get over it. Where the bar is placed changes, and ‘it depends’. Are people a new kind of fuel? No, of course not, just one we have not been leveraging very well. Why, because people are passionate, if they are not, they want to be, and we want them to be passionate. John Hagel wrote a nice post “Shifting Identities – From Consumer to Network Creator“. It is a post worth reading for sure. Again, the title sounds a bit complex, but it is not really. The post talks about many things, the last part focuses on the mounting pressures at work. Unfortunately, not many employees are passionate, this will become a problem for Social Businesses. As a business, you will need to encourage employees to find passion, otherwise people will struggle to cope with the pressures.. By the integration of personal and professional lives people will be able to become passionate and passion shines through. We are Social, we are people and when we all truly recognize that, we will be able to realize a Social Business. Is this a change in business culture, probably…your thoughts?